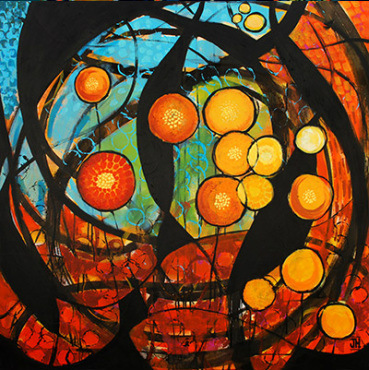 “Painting is my connection to the mystery.” —Jenny H.
UVC Gallery Committee member Jenny Hahn captures the inward journey through bold, colorful expression—whether figuratively or abstractly. Her style involves painting “from the inside out”, allowing the image to unfold organically, layer upon layer. 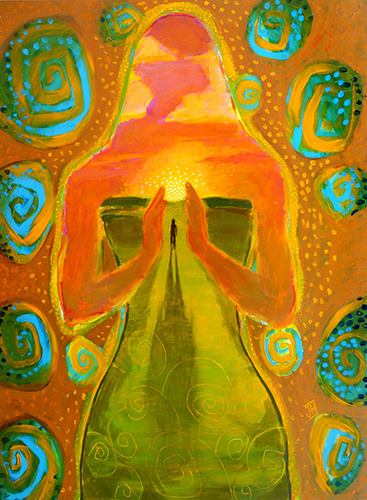 Her intention is to uplift and inspire the viewer with images that feed the heart and soul. Jenny received her BFA in illustration from the Kansas City Art Institute in 1999. She is co-founder/owner of Creative Nectar Studio, where she facilitates process-painting workshops to help people tap their inner creativity and learn to live more authentic lives.